Hi, Allie McMurphy here. My writer tells me that even though it is Spring time in my world, it's the holidays in yours and with the holidays comes a wonderful Killer Character giveaway. I thought you should know what you are getting should your comment be the winning comment today. 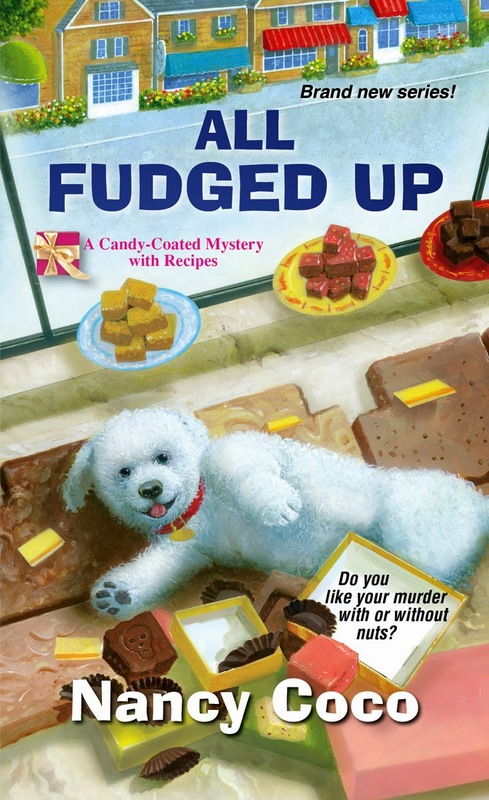 And so I titled this blog Mystery, clues, a puppy and fudge for the holidays. I know. I'm more clever with fudge than I am with writing. Now I would much rather prefer creating new fudge recipes than following clues to solve a murder, but it turns out I'm pretty good at both. It's the mystery and my introduction to the Mackinac island community that make this tale of old secrets and new friendships so much fun to tell. I mentioned the Wizard of Oz because it was a holiday tradition in my family to watch it. My Grammy Alice would make popcorn. Papa Liam would make fudge and we would gather together with the holiday lights in the background and we'd be off to see the wizard. What I want to know is, what is your favorite family tradition for the holidays? Cheers and good luck and more importantly Happy Holidays. Watching Carols by Candlelight while wrapping last minute gifts, although with safety issues it's usually flashlights (we call them torches) or glow sticks now. Making mama'schocolate chocolate logs for Christmas Eve dessert while listening to classic Christmas music. Even though now it's supplied by an iPod rather thAn a phonograph player. Sigh...progress. happy Holidays! Listening to Christmas music most of every day and getting out the Christmas dishes. I'm starting my Christmas dish collection this year. They are always so lovely in the store. It's time to start a new tradition. Thanks for the idea. Cooking Christmas Eve dinner and visiting with a friend on Christmas morning. Love the pup on the cover. Visiting is always great. I have no idea why we wait until Christmas to visit the older house bound. Must make a resolution to try and do that more often. Thanks for the idea. We'd gotten out of the traditions habit and this year, in a new place, are just beginning to feel the desire to re-establish some. First up, some candles for the windows (did that last night); next, a few holiday decorations around the house. We've not finished unpacking, so this will push us to clear out some more boxes, rearrange china cabinet, and make room for more festive elements. I think our tradition will begin with decorating a tree and just sitting and enjoying it for the first time in a long time (more than 15 years). Wow - that is too long- glad you are in a place where you can restart your traditions! Thanks for reminding me to put candles in the windows. It's just not the holidays if I don't get to watch White Christmas, Rudolf and How the Grinch Stole Christmas. I agree. Rudolf, the Grinch and Bing Crosby all tops on my holiday favorites list. My sister and I give each other presents for the 12 days of Christmas. What a fabulous idea - little thoughtful gifts are the best in the world. We love to watch Christmas Story. We open gifts Christmas morning. Our daughter traditionally hands them out, and we pen them one at a time so we can ooh and ahh! I have to admit I've never see Christmas Story-trust me my children are horrified by this lack of culture. My Grandpa used to hand out the gifts one by one. Thanks for bringing back that lovely memory. My Mom makes rum cake for the holidays. Rum cake is awesome! I used to make and sell them during the holidays when I was in High School. I'm gluten free now, but there must be a way to make them gf as well. I remember The Wizard of OZ being shown every Christmas Eve. I usually make fudge to give as Christmas gifts. I don't have a favorite Christmas tradition anymore. Usually I have to work. People who have to work on Christmas have a special place in Heaven. I'm certain of it. This book has ten fudge recipes you can enjoy any day of the year. Family is a key part of the holidays. my favorite Christmas tradition with my family was at the stroke of midnight, we all kissed each other & wish one another a Merry Christmas & a Happy New Year!!! Oh Cyn, that is a fabulous tradition! I lived in the KC area for 12 years, and you are right. Tha Plaza lights are awesome. and there is a nearby neighborhood that strings lights across the streets. Do you know that one? I think it's in Mission or near Mission Hills. Christmas Eve at my in-laws and then home to see what Santa has brought us while we were gone! Watching the movie "A Christmas Story and A Christmas Carol". I love a Christmas Carol. Must have a movie marathon this Christmas. My Dad cooking breakfast on Christmas morning. Yum, did he have a specialty? Watching any one of several versions of Dicken's Christmas Carol. I once saw a single actor do the entire story alone on stage. He was fantastic- non stop energy. Just hearing the word "fudge" makes me think of Christmas! Both for eating and watching A Christmas Story. Loving these posts and moved several books to top of my TBR list. Our tradition is to stick with the same old routine - we add new ornaments or do new things but for the most part stick with what we know we love. Love to ease into it and enjoy every moment, remember way back when when kids were little (before grandkids!) - savor the memories, especially of those not now with us. Christmas dishes go into the china cabinet the first of the month and Christmas placemats go on the table - Christmas songs and movies playing non-stop. I add a new ornament a year as well. Love your tradition. I used to make fudge and popcorn balls at my grandma's for Christmas (along with many other things) but she's gone now and so my favourite tradition that is still continuing is also a must-watch but it's Christmas Vacation. Christmas Vacation is a hoot!! Another to add to the Christmas day marathon. Is that a warning against fixing up your place? I'd prefer to avoid finding dead bodies. A rule I follow sincerely. I love getting together with my family to open presents and then have Christmas dinner. Do you have traditional foods on Christmas? We always had our tree up and decorated by December 11 because that is one daughter's birthday and we needed it done for that. This year we aren't doing any of that as we are in the process of moving and we are living in a motel for a few weeks. It will be a different Christmas this year! That happened to us one year as well.Wishing you happy, carefree moving! We love to make chex mix to snack on during the holidays---I think I'll go make a batch right now! Yes, the great aunts always brought Chex mix to the Christmas eve party. Even better I can make it gluten free! Doing our Christmas cards together. Made it fun and it goes faster. I love to still do snail mail cards. It's a moment and a personal note that brighten the day. I do love decorating the Christmas tree. We set it up on the first of December. It is so much fun & full of memories. Decorating the tree is one of my favorite parts as well. We don't do fruitcake, but we love my grandmother's applesauce spice cake, secret ingrediants and all. I inherited her cake pan since my mother's oven could never get a cake to rise. So, I make one for Thanksgiving, and one for Christmas. Even if we are too full of Thanksgiving or Christmas dinner, we enjoy the cake for the rest of the week. What a great tradition. I made applesauce walnut spice donuts today and frosted them with maple frosting. A little bit of heaven. Thanks for sharing your tradition! 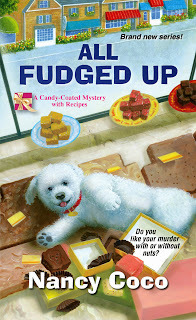 Mystery, clues, a puppy and fudge... These are a few of my favorite things. And baking the Christmas cookies. My mother used to take our presents & put them in various boxes. She even took shoes out of boxes & would roll clothes to fit them. She would come out of the bedroom, hand us a box & say wrap it. We would be watching Blue Hawaii with Elvis. We did this every year. The funny thing was when she would had us a gift we had wrapped. she did this all the time. I do this now with my family & friends. What a cool and funny thing to do! Plus Blue Hawaii and Elvis!! I'm so excited. I visited Michigan years a go but never made it to Mackinac Island so I'd love to begin a series that is set there. Mackinac Island is a lovely place and lucky for me near my parents. I can't go a Christmas without watching Cary Grant in The Bishop's Wife and An Affair to Remember. I love to make cookies with my nephews ages 14 and 11, although my 14 year old is much more interested in eating them!! Writing out Christmas cards gives me joy to remember family and friends, both old and new. My nephews and I go to Christmas Eve service with their mother and then we spend Christmas day with my crazy, wonderful extended family, reminiscing about Christmases past and making new memories. Your Christmas sounds fantastic. Two more great movies ot add to my Christmas marathon. Thanks! Yesterday we took the kids out to cut a down a tree which is a tradition my husband and I started when we first started dating. That along with stories and puzzles by the fire, making gingerbread houses (although my kids seem to eat most of the candy before it gets on the house), making crafts for our family and friends (and promptly remembering how we aren't really that good at it) and watching the Grinch Who Stole Christmas multiple times are our traditions at home! Wishing you all a wonderful holiday season! What a great picture of Christmas- we used to take the kids out to a tree farm every year when they were little. Thanks for sharing! I love getting to watch "It's A Wonderful Life," (when all the holiday to do lists get smaller) and eating our homemade Christmas Cookies. We usually get together with family and go driving to see all the beautiful lights and decorations outdoors too! Merry Christmas! Making decorations with my kids and now my grandkids to put on the windows. Aren't Christmas crafts with the kiddos the best? Enjoying spending time with loved ones, baking, and watching A Christmas Story! Enjoy watching a few sappy movies on the Hallmark Channel while reading a mystery at the same time, and eating Christmas cookies.